Marvel is getting into the holiday spirit this October with the all-star comic book event Avengers Halloween Special #1, an anthology of seasonal stories, including one by the Soska Sisters, featuring Captain America and the rest of the team, along with Daredevil, the Punisher, and the X-Men, and the brilliant cover art has just been unveiled. Read on for the official press release and a first look at the cover by Geoff Shaw, with jack-o-lanterns of fallen heroes and Venom costumed as a wicked scarecrow. With bonus stories featuring your favorite Marvel heroes, including Daredevil, Punisher, and the X-Men, AVENGERS HALLOWEEN SPECIAL brings together an epic team writers and artists to take your favorite characters on all-new frightful journeys, including acclaimed creators Gerry Duggan (Despicable Deadpool, Infinity Countdown, Infinity Wars), Robbie Thompson (Doctor Strange and the Sorcerer’s Supreme, Spider-Man/Deadpool), and Juanan Ramirez (Uncanny Avengers)! Plus, Canadian horror producers and screenwriters Jen Soska and Sylvia Soska (The Soska Sisters) (American Mary, See No Evil 2) and superstar writer Jay Baruchel (Goon, This is the End) make their Marvel Comics debut! Don’t miss all the horror and thrills this October, written by Gerry Duggan, the Soska Sisters, Jay Baruchel, Robbie Thompson, and more; with art by Juanan Ramirez and more. You can see the awesome cover by Geoff Shaw below. 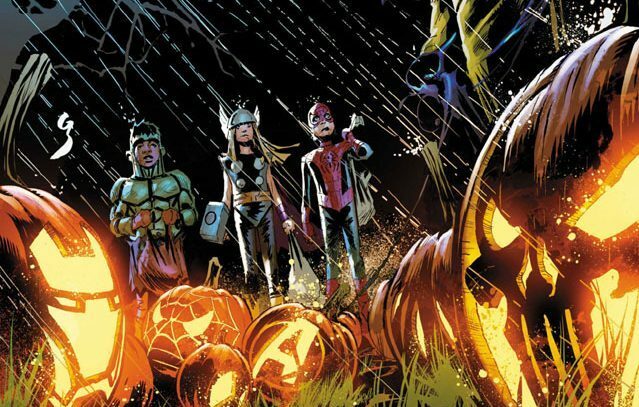 Marvel’s Avengers Halloween Special #1 hits comic shops on October 3, 2018.